3-4-44 inside our apartment : looking towards door, Jerome R.C. 1 drawing on paper : ink ; 6 x 9.5 in. 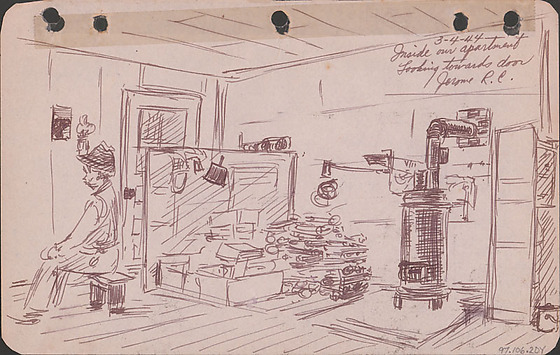 Ink drawing of interior of artist's apartment at Jerome Relocation Center, Denson, Arkansas on March 4, 1944. A person in a hat is seated at left on a stool with hands on knees, looking to left edge. A closed door is located next to corner where two walls meet at back left. In center of room are boxes and stacks of materials next to a screen ; black dust pan hangs from screen. On the right is a black stove with a pipe extending to wall. A cabinet next to a pail on far right. Drawing 97.106.2DZ on verso of same sheet. Hoshida was one of the seven to nine hundred Japanese Americans in Hawaii who were incarcerated in Justice Department internment camps. He was acutely aware of the importance of recording his experiences through the pen and ink drawings and watercolors he made during his incarceration in five different locations. While Hoshida did not attempt to make any overt commentary on the interment, his drawings and sketches provide a continuous and detailed account of daily activities and his long journey from Hilo, Hawaii, to the desert of Arizona. Written in black ink, top right: 3-4-44 / Inside our apartment / Looking towards door / Jerome R.C.